We all know I’m peanut butter crazy. Right, we ALL know? 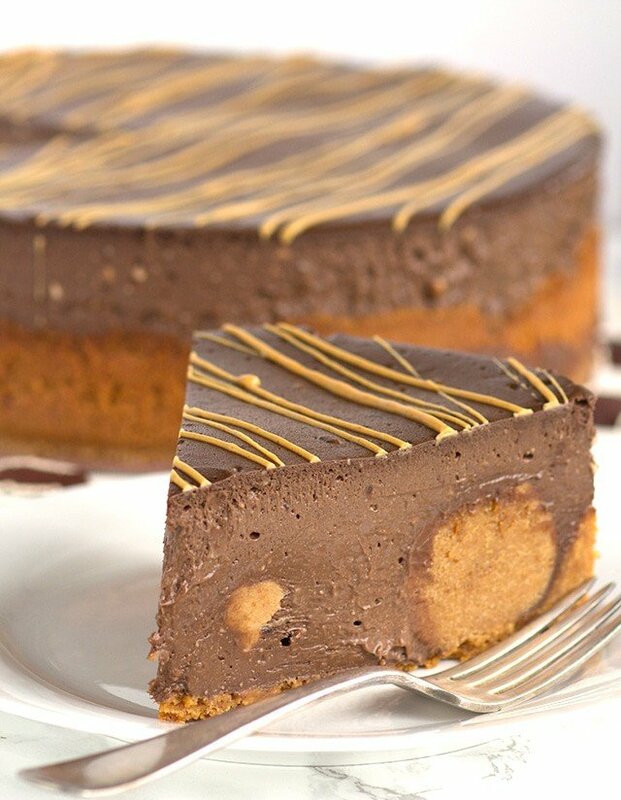 If not, take a peek at all of my peanut butter recipes. It’s ridiculous..ly amazing! Nutter butters dipped in hot cocoa is like the most amazing winter snack you can possibly have. So, I kind of turned that thought into a refrigerated dessert. Sometimes the heat is too much even here in New York and I can’t bare to put anything warm into my mouth. I might feel differently if we put our air conditioners in, but we haven’t caved yet! Yay for a lower electric bill! 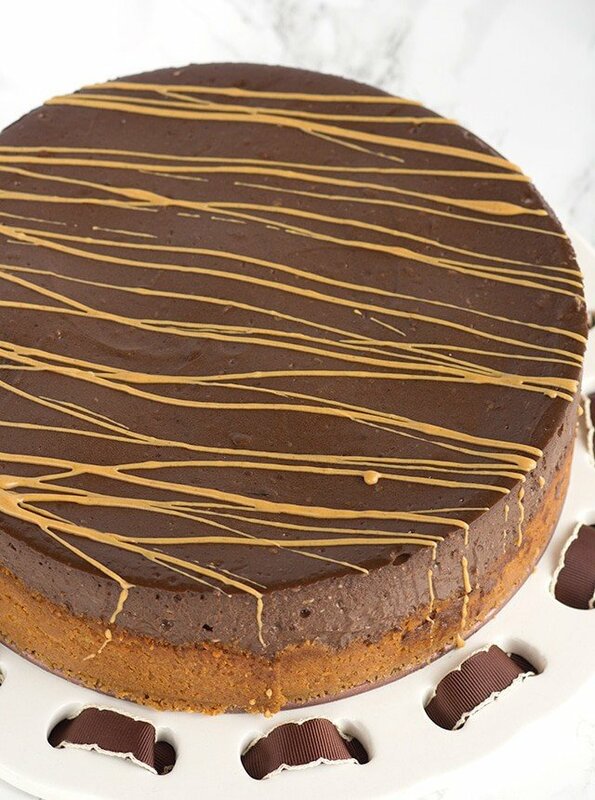 So, the peanut butter drizzle on top of the cheesecake not only looks pretty, but it’s also used to distract. My peanut butter cookie balls are big. When baking the cheesecake, the cheesecake sort of has lumps in the top of the cheesecake where the balls are. If you make smaller ones or even maybe just a pressed layered into the cheesecake, you could probably avoid the lumpy top. Seriously though, the drizzle pretty much hides it! I’m so lucky that when I made this we happened to be going down to my parents. This sucker was huge and decadent. I don’t know if my little family of 3 could have done the job eating it. We’re basically a family of 2 and one-third since Lucian doesn’t eat enough to count for even a half. My mom’s neighbor asked why he was so scrawny the other day. I was kind of speechless. Um, because he’s 5 and he thinks he knows what’s best for him? He’s a skinny mini like his Papa and Unc. Using a food processor, throw your nutter butter cookies into it and pulse until they are all crumbs. I used the round nutter butters and used 27 cookies. Add the room temperature cream cheese into the food processor and pulse until incorporated and a cookie ball forms. Scoop the balls with an ice cream scoop. Roll the balls between your two palms until perfectly round. Place on a parchment lined baking pan and repeat with the rest of the balls. I think I got 10 - 12 balls out of it, but you can make them smaller like I said in the post. 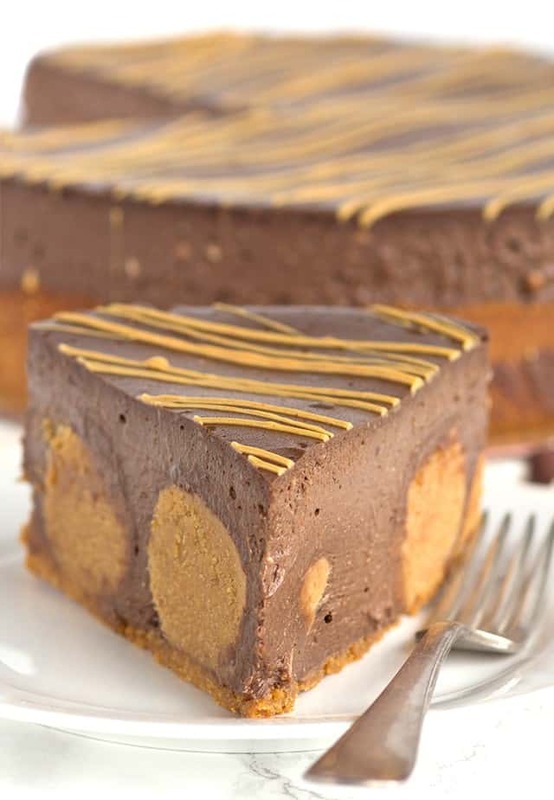 Place the peanut butter balls into the freezer for 30 minutes while you're working on the rest of the cheesecake. In the food processor, add in the round nutter butters and pulse on high until there are only crumbs. Pour the melted butter into the food processor and pulse until the crumbs look like wet sand. Press the nutter butter crumbs into a 10 inch springform pan. I pushed mine up the sides slightly. Place into the preheated oven and bake for 10 minutes until the crust is slightly browned. Reduce heat to 325 degrees and work on the batter. Place the chocolate over a double boiler over medium heat and let melt. In a mixing bowl, add in the cocoa powder and granulated sugar. Mix until combined. Add in the cream cheese and melted chocolate. Mix until completely incorporated. Scrape the sides and bottom of the bowl and mix again to avoid any lumps of cream cheese in your batter. Before adding the cheesecake mixture, line the outside of the spring form pan with heavy duty tin foil. I double wrap it to prevent the water from leaking in. Remove the peanut butter balls from the freezer. Place the balls into the cooled crust. I did placed 4 balls in the center of the crust and 8 on the outside. Pour the cheesecake filling into the crust. Give it a few taps to make sure the cheesecake filling fills in any air bubbles. Place in the oven at 325 degrees and let bake for 53 minutes to 1 hour or until done. To make sure the cheesecake is done, give it a wiggle. If it slightly jiggles in JUST the middle like jello, then it's done. If it jiggles all over, it needs to bake longer. Turn off the heat and crack the oven door slightly. Let it cool in the oven for an hour or two. I kept mine in the oven for about 2 and half hours and then placed it in the fridge overnight. Place the peanut butter into a microwave-safe bowl. Melt for 20 seconds until runny. Pour the peanut butter into a sandwich bag and cut a small hole in the corner of the bag. Apply even pressure and move your hand back and froth to add a peanut butter drizzle to the top. 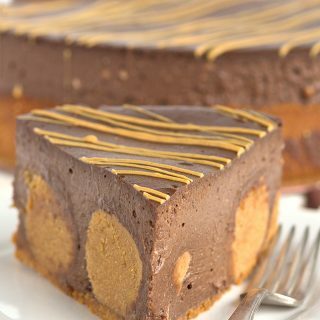 The cheesecake top may have a bumps from the nutter butter peanut butter balls. The peanut butter drizzle will help cover it up slightly! Wow! This is one decadent looking cheesecake, Miranda! I love that you put peanut butter balls inside!! That’s just genius! Dying for a large slice of this!! Nadia is the complete opposite of Luc. You put food in front of her and she eats it. She is like a human garbage disposable, that one. If you lived closer, I would definitely hook you up. Let’s switch kids for a few days! I could use someone to clean out my fridge and cupboards! What a great recipe – sounds totally delicious and I love how it looks too! gorgeous! That is one yummy looking cheesecake! 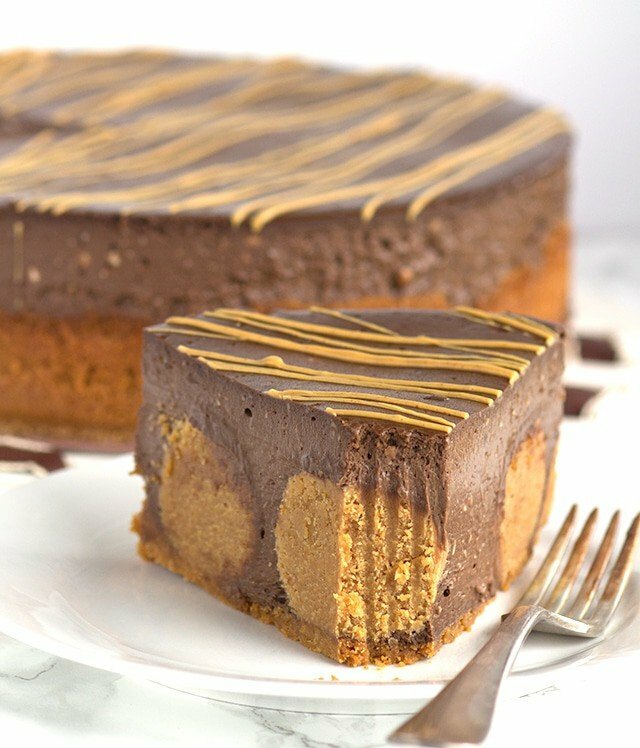 I can never resist cheesecake…when you match peanut butter up with chocolate and then add cheesecake, all willpower is gone! Oh my stars and garters I want to eat this RIGHT NOW! Can’t wait to try it. My family is crazy for chocolate and PB. Thank you so much for joining the gathering at Thoughts of Home on Thursday. Thank you Julianna! It was heavenly! Oh my goodness, this sounds incredible! Thanks for linking up with Merry Monday – I’m pinning your recipe! Drool! The hard part about this recipe is trying to figure out which delicious looking photo to pin on Pinterest! Thanks for the great recipe! This looks so amazing! I love the peanut butter balls! When do you use the 1/2 cup of heavy cream the recipe calls for? ?